Bali Jade Villa is within walking distance of Sanur's four-mile stretch of beach and approximately 20 miles northeast of Bali's Ngurah Rai International Airport. 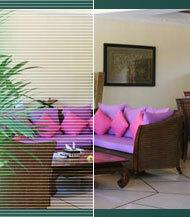 A range of restaurants, boutiques, salons, and a traditional market are nearby. 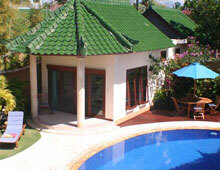 Located in one of the most desirable, prestigious, residential areas of Bali. Celebrities such as The Duchess of York (Fergie), Mick Jagger, David Bowie, Sir Cliff Richard, and many others have vacationed in this area. Enjoy the swimming, snorkeling, scuba diving, boating, and fishing in the protected lagoon. There is everything you need for year-round enjoyment and an excellent lifestyle including plenty of sunshine, inexpensive massages, low cost of living, and abundant recreational activities. 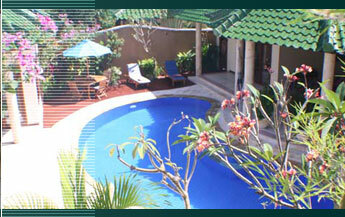 Built to high quality western standards, with impeccable services and large exotic private swimming pool. Being awake in the middle of a melody of colorful birds and the breeze off the nearby ocean rustling through the coconut trees. The property's amenities include the massages treatments, housekeeping, 24-hour security service, and two-story office, store, and restaurant complex. All villas feature private roads and entrances, separate living rooms and bedrooms, cable TV, high-speed Internet access, and nine-meter private pools.